Ken Armstrong Writing Stuff: Say, Cheese? I've posted once before about some of the fun things that get said at our dinner table. After much wild-guessing, he was very impressed to hear that the answer was, of course, Buffalo. Yesterday, we had a pizza which had some Mascarpone on top. There was a thoughtful silence when it landed on the table. "So," said he, "Is this one from ponies?" I got my Tom Waits tickets for Dublin, Aug 1. I queued up from 7.00 am like a young fella to get them. This will be my fourth time to see the great man live. I posted about the second time previously. Aren't kids the best--what comes out of their mouths... hilarious. Yours is obviously a very clever young man! Yup... takes after his mum. Smart boy. What about Gorgonzola? I had a friend who was a huge Tom Waits fan, but I have to admit, I never got into his music. (I was in my early 20s at the time, so perhaps I might like it now, who knows?) I have seen him in a number of films - as Renfield in Coppola's Dracula, in Robert Altman's Short Cuts and who can forget Jarmusch's Down By Law? I always thought him to be quite a good actor. I can however, identify with your excitement at going to see a great performance. My husband and I have tickets to see Leonard Cohen, here in town next Monday night. We are big fans of his and particularly enjoy his Field Commander Cohen live album (you may know it). I love The Stranger Song and from a later album, Take This Waltz. Music is a great catalyst for me and for my writing. Do you find it spurs you on as well? Awful puns involving phrases like "big cheese" spring to mind but I'll keep them to myself and not lower the tone of your blog. So Gorgonzola... is it from Gorgons or... em... Zola? he he he, my granddaughter comes up with such statements too. 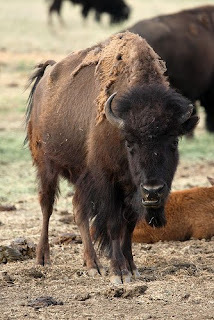 That's a bison (probably American) in the photo, not a buffalo! Mozzarella buffalo are very different animals. Noble and majestic. Honest. I'm sure *someone* could lower the tone of my blog, if they really really tried (certainly not You or Dave) but the people who comment here are wonderful erudite folk and I must defend them to the death, well, 'til teatime anyway.